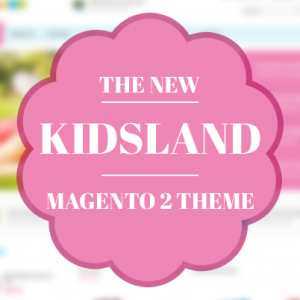 Here comes our first premium Magento 2 theme for kids: UB Kidsland! Absolutely charming storefront and clean from the header to footer. If you start businesses in the Kids-cloths industry, or anything related to family and kids, from clothing, shoes, accessories, toys, and etc., UB Kidsland just knows how to focus on your products and messages. The simple design with colorful details will grab both kids and busy moms and dads’ attention. 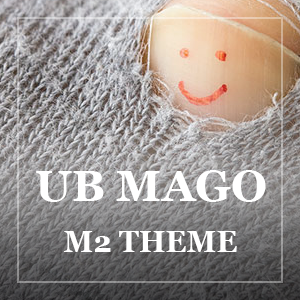 I am glad to announce that the 3rd responsive Magento 2 Theme at Ubertheme -- UB Mago (beta) is on air today. It is well-suited for any fashion store, with the minimalistic yet clean and bright look and feel. Designed specifically for classy fashion store, UB Mago follows the simplicity design trend, with clean block layouts and the two major color schemes -- Black & White. It surely gives your fashion stores the high-class look it deserves. 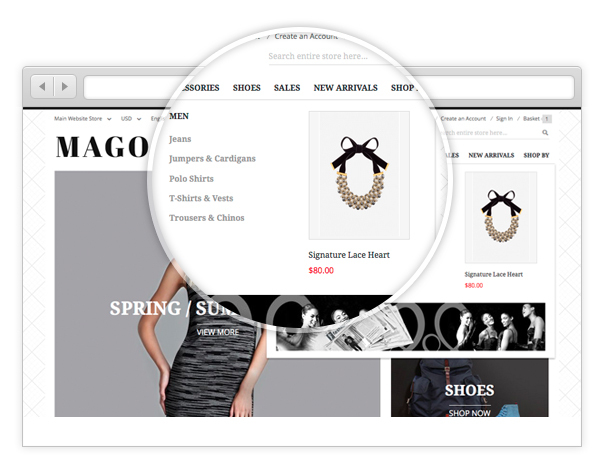 By using the neutral background color, UB Mago works well against diverse color palettes from your products’ images. This simple design aspect is one of the most prominent ways to highlight your products and more important, influences how you can get your customers engaged in the products. July 13, 2018 Update: UB MegaMall 1.0.9 has just been released. 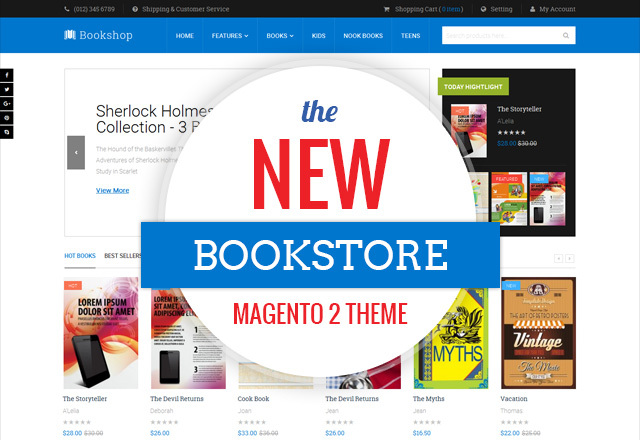 It’s fully compatible with the latest Magento 2.2.5. 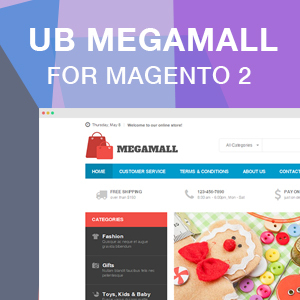 Today I am super excited to introduce our 2nd premium Magento 2 theme -- UB MegaMall. I had chance to share you a peek of some key features we were working on two weeks ago. UB MegaMall is great out of the box since its first release in Magento 1 and has been proven to be a good fit for large-scale eCommerce store, from digital stuff, souvenirs to fashion. One of the driving concepts behind this theme is giving possibility for listing a wide range of products, with rational promotional blocks. 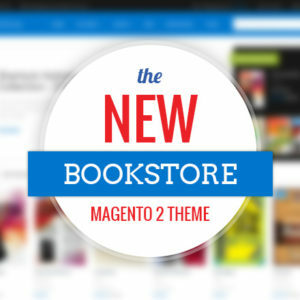 Whether you want to jumpstart your new Magento 2 build or migrate your Magento 1 store to Magento 2, UB MegaMall enables you to use the theme in brand new ways. 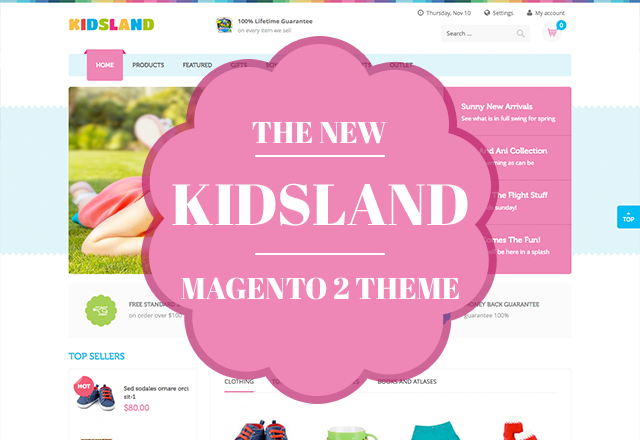 Today, we’re excited to unveil the Crafts -- our first premium theme for Magento 2. 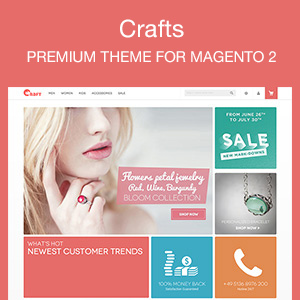 Crafts has been one of the most wanted Responsive Magento 1 theme in our portfolio. It comes with the beauty of simplicity, from typography, grid-based layout and structure. If you keep an eye on our product development, you might notice our first Crafts theme for Magento 2 was initiated since Dec 2014. As can be seen on our Github, this Crafts version based on Magento alpha 1.0.7, yet we hardly find chance to keep ongoing updates to this free version because there have been huge changes in Magento 2 since then and our internal plan as well.